The cached Host volume is shown as a new Tab in the application. This is to manage the cache. Though no maintenance is needed at all, you can see statistics and change settings or remove the cache. 2. Cache Volume letter and cache size. 3. RAM Cache Informations. Current and maximal usage. 4. Firmware Information You can see wether the Computer runs on BIOS or EFI / UEFI. 5. Trial information When the trial time is over, the cache will be turned off. 6. Additional information about current cache usage. And Cache Strategy Management. 7. 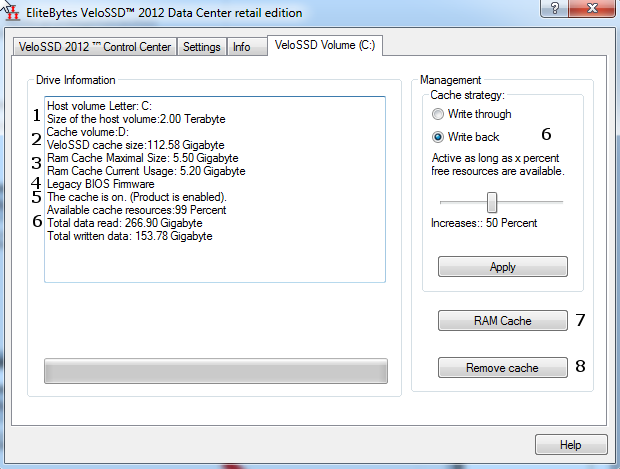 RAM Cache Settings. This Control is explained in the âHow to add a Cacheâ Chapter. 8. Remove Cache See the chapter below about removing the cache.